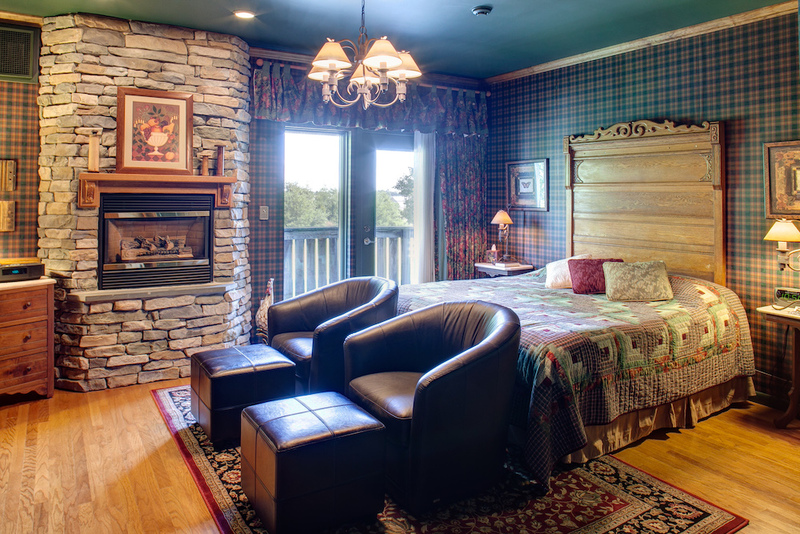 This is a grand country king suite with fine finishes like black leather chairs and antique wood furniture. 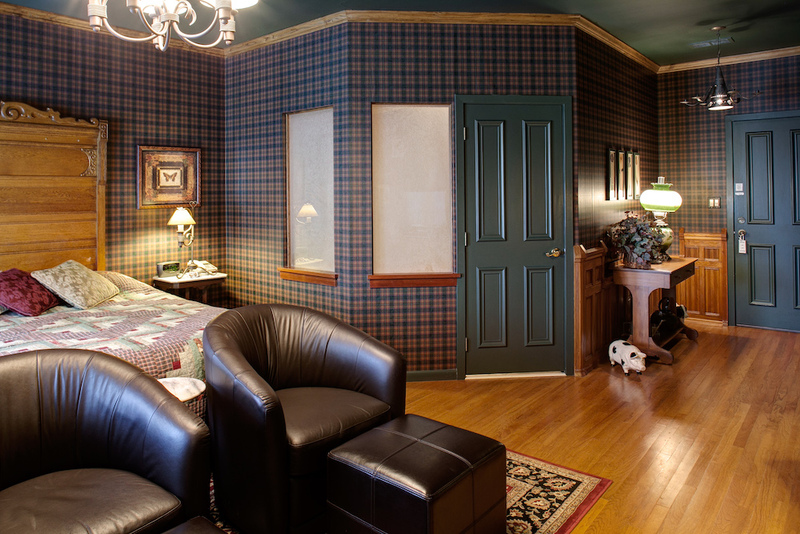 Walls and linens are colored with deep burgundy and hunter green floral and plaid. 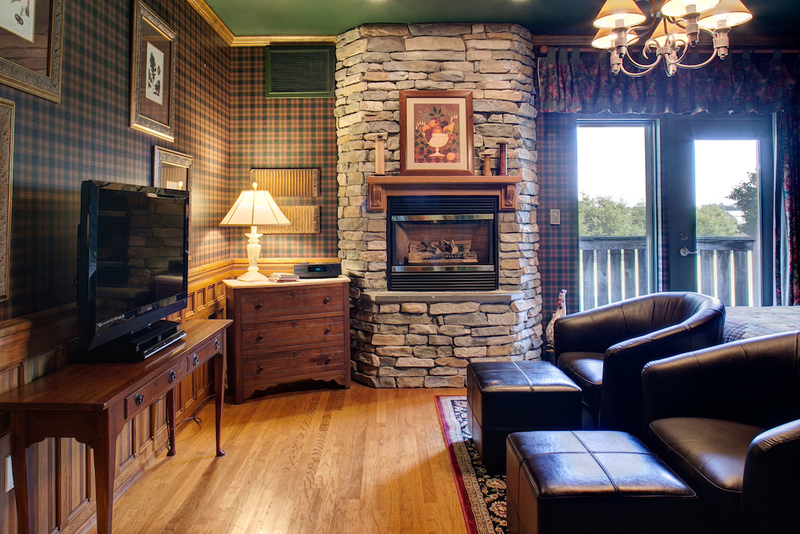 Enjoy coffee or cocktails on your private balcony with views and come inside to relax in front of the stone fireplace. 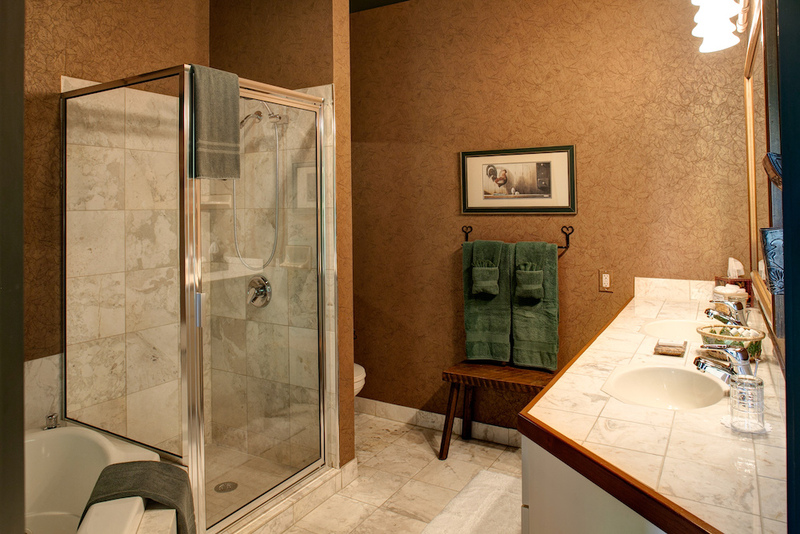 The impressive bathroom has a two-person Jacuzzi, walk-in shower, and double sinks. Thank you for the respite and little “sanctuary” from the world. Loved the room and the comfy bed and pillows. Breakfast was absolutely scrumptious! Once again we enjoyed our stay and wish it was longer! I could sleep all day away in the peace and quiet of this beautiful room. This is our 4th visit here and we can’t wait to come back. As always breakfast was so yummy. I could smell it when I woke up! The gardens are so pretty this time of year & I love the fact that those flowers are on the tables at breakfast. See you next time. My wife and I struggled to find a weekend getaway for our 20th anniversary. We couldn’t have found a better place. As soon as we pulled up to the property we knew we found the perfect place. The landscaping is breathtaking. Once inside we felt right at home. The facility is beautiful, the rooms have so much space and the views from the rooftop deck make you feel like you’re in a postcard. The grounds are so peaceful and we met some new friends that we look forward to seeing again next time. Brenda makes an AMAZING breakfast!!! Thank you for a great weekend. 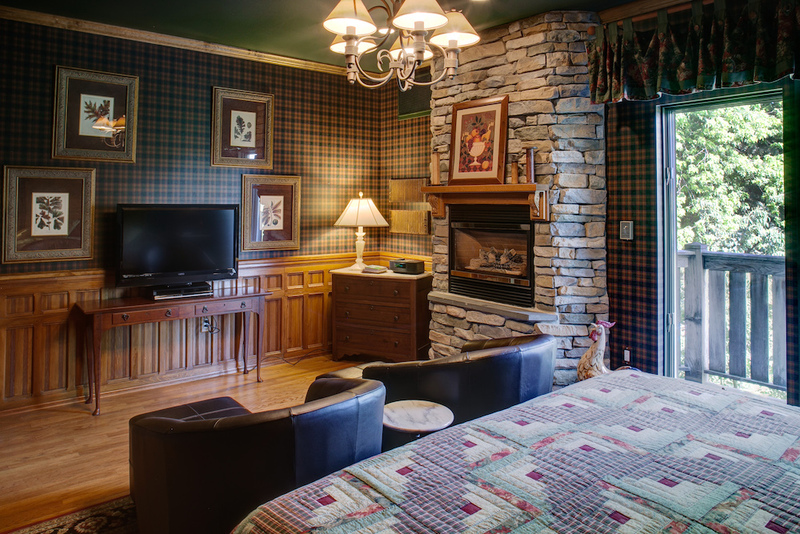 Our 3-night stay in the Country Oak Suite was wonderful, very roomy and comfortable! 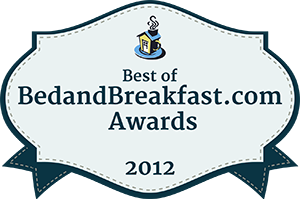 The B&B is gorgeous and has a very relaxing atmosphere. The ground and landscaping were beautiful. We felt very much at home here! Thank you! Quaint, countryside decor with antique furniture and lighting fixtures, king size pillow top bed and a resident porcelain rooster. 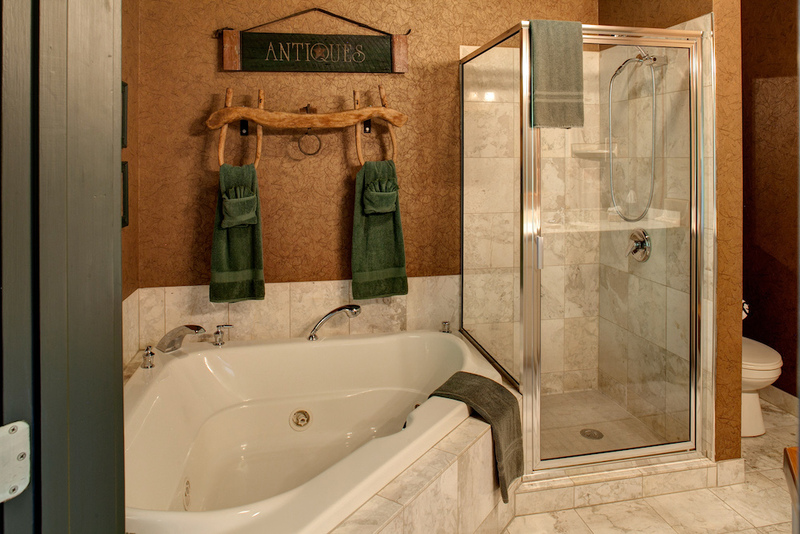 Spacious bathroom with Ox Yoke towel rack, jacuzzi, glass shower, double sinks, private balcony with countryside view of farms, an auxiliary stone gas fireplace, and air conditioning.